LAHORE: The beads of the tasbeeh in her hand are beginning to move faster. She wipes off sweat from her forehead with her lawn dupatta, due to anxiety and the intense 48 degree heat of Lahore, with load-shedding in its 5th hour in a house in Safanwala Chowk. The dark magenta bedspread seems to intensify the heat in this bedroom on the second floor that serves as a makeshift waiting room for families of “patients”. What is allegedly an “operation theatre” is a tiny claustrophobic room constructed on the roof. “It’s been almost an hour. Safaai normally doesn’t take so long,” says the worried middle-aged mother, looking out of the semi ajar window overlooking a lane off Temple Road. Her 27-year-old daughter is a mother of five, getting an abortion done. The infamous abortion clinics of this area still exist, but most have been relocated into lanes to avoid attention of the media and health officials concerned. It was after an hour of asking around and driving in the area that a shopkeeper in a secretive manner guided The Express Tribune team in. Immediately, a female gatekeeper locked the gate from inside. “We don’t want anyone to know this is a clinic,” said the over-worked woman who introduced herself as a doctor, but had no degree, certificate or anything that confirmed that she is a medical doctor. The clinics of this area have had thousands of abortions take place in them, some as late as in the 5th month; while the clinicians advise against abortions at an advanced stage, they oblige for some extra money. Timely FP could save lives of not just the unborn foetuses but a multitude of Pakistani women. A national survey of public-sector health facilities estimated that about 200,000 women were hospitalised in 2002 alone for abortion-related complications. “We get cases of perforated uterus, guts, intra-abdominal complications, all complications of unsafe abortions,” says Dr Nadeem Khalid of Family Health Hospital, Lahore. The methods used are unthinkable. Ingesting large doses of drugs, inserting a sharp object into the uterus, drinking or flushing the reproductive tract with caustic liquids, vigorous movements like jumping or physical abuse, and repeated blows to the stomach are some of them. Incidents have been reported where bowels of the patient are pulled out by mistake through the reproductive tract. If the woman survives, she can suffer from long-term disabilities and infertility. Incomplete abortion, hemorrhage, trauma to the reproductive tract or adjacent organs and sepsis (bacterial infection) are common. Post-abortion complications, experts say, account for a substantial proportion of maternal deaths in Pakistan. Out of the 2.4 million unwanted pregnancies in Pakistan in 2002, some 900,000 were terminated by induced abortions (Studies in Family Planning 2007). The actual number is definitely higher, considering the unaccounted for cases. In a country where only an estimated 30 percent women use contraceptives (NIPS study: 2006-2008), induced abortion is used as a form of contraception. Contrary to popular belief that most abortions are the last resort of promiscuous women, a Population Council study shows that a staggering 96.1 percent of the women who get abortions done are married women. The abortion rates in the more urban provinces of Punjab and Sindh are substantially lower than those in the Khyber-Pakhtunkhwa and Balochistan. In urban areas, the contraception rates are higher. The reason why shady clinics and unskilled women end up performing these abortions are two, the main one being simple economics. A doctor in a lower income area would charge an average of Rs2,600, whereas a traditional birth attendant (TBA) would charge as less as Rs770, says a study by Marie Stopes Society, 2008. Secondly, most certified medical practitioners avoid performing an abortion not just because of religious reasons, but also because they are afraid of legal complications. Under the 1990 revision in Pakistan’s Penal Code with respect to abortions, the conditions for legal abortion depend on the developmental stage of the foetus. Since 1997, under certain circumstances, abortion is conditionally legal in Pakistan to provide “necessary treatment”. Posted in Health, Women and tagged Family Planning, Family Planning and Islam, Family Planning in Pakistan, Lahore, Misoprostol, reproductive health, Temple road Lahore abortion clinics, unsafe abortion, unsafe abortions in Pakistan. Bookmark the permalink. “What do you think Islam says about Family Planning (FP)?”, I asked an urban, educated friend. Her response was as expected. “Isn’t FP a complete no-no in Islam?” she replied, a mother of two, whose two children have a carefully planned age difference of four years and who has been using an Intra-Uterine Device (IUD) for a long time as a method of contraception. A staunch Muslim, she believes FP is not allowed in Islam, yet is practicing it for years, and has not bothered to delve into the subject, avoiding tricky subjects. As we approach the World Population Day on the 11th of July, the topic of understanding FP via religious rulings remains taboo. A fatalistic approach and a misfounded assumption that Islam is categorically against FP remains a key reason why Pakistan is sitting on a ticking time bomb of a population explosion. It also remains an under-discussed area in both print and electronic media. “Today Pakistani population is five times as large as it was in 1950 and about 4 million people are added to it every year,” said Dr John Bongaarts of the Population Council, New York, at a recent seminar arranged by the Population Council in Pakistan. “By 2050, the population in the country is expected to reach 300 million.” If it hits that number, Pakistan would become the fourth largest country in the world. It has already replaced Brazil as the world’s fifth largest nation. Generally, world over, a reduction in fertility rates and population growth has been seen, but Pakistan’s has increased. Pakistan’s total fertility rate (TFR: the number of live births the average woman has in her lifetime) is reported by the UN to be 3.2, the highest of any of the populous countries. Pakistan Demographic and Health Survey 2007 (PDHS) reveals that only 24 percent of married women of rural Pakistan use contraception. Could religion have something to do with it? This July, world leaders gather in London for a Family Planning Summit, co-hosted by the Bill and Melinda Gates Foundation and the U.K. Department for International Development, supported by the U.S. Agency for International Development and the U.N. Fund for Population Action. Will the role of religious and cultural sensibilities be discussed there, one wonders. In strongly faith-oriented societies such as Pakistan, unless something is endorsed by the clergy, meeting the development goals may be too far-fetched. As the bigwigs of family planning rack their brains over how to control Pakistan’s population, an important point might be being missed. The implications of an absence of national consensus-building with religious leaders on board may be a key reason. Indonesia, the world’s fourth most populous nation, also THE most populous Muslim country in the world, seems to have discovered this key and unlocked the answers. The result: Indonesia today is known as the “poster child” among countries aiming to slow down their growth rate. This is an incredible achievement, considering that Indonesia is a country with an almost 90 percent Muslim population, accounting for 13 percent of the world’s Muslim population. Studies show that Indonesia’s fertility rate at the 1965 level was averagely 5.6 children per woman. By incorporating a community-based family planning and reproductive health program, Indonesia has been able to slow down the TFR to an exemplary 2.6. How has Indonesia managed this? The answer could lie in the fact BkkbN, Indonesia’s population and family planning board, employed the ingenious method of approaching the leaders of the two largest Muslim welfare groups in Indonesia: Muhammadiyah and the Nahdlatul Ulama, who have millions of followers. Both are traditionalist Islamic groups, yet with the government have achieved a consensus that they will work hand-in-hand for the welfare of the country. 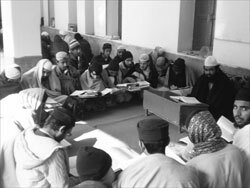 In line with true Islamic teachings, they work towards spiritual, emotional, physical and material well-being of their people. Taking health and education into their loop, it was but logical that reproductive health and FP are included in their program. Dr. Atikah Zaki, the health and social coordinator of Asyiyah, the women’s branch of Muhammadiyah, adorns a hijaab. She is a practicing Muslim woman, unapologetic about her faith and evangelism. Simultaneously, she is also unapologetic about the fact that her organization promotes family well-being and family planning. Asyiyah promotes family planning through a network of 86 hospitals, hundreds of clinics, 87 universities and over 4,000 schools. Their local leaders counsel people about reproductive health issues, mediate disputes between couples and even address sensitive subjects like domestic violence. “We are just obeying the Prophet Mohammed,” said Zaki with a smile, explaining the concept of FP in Islam, quoting from the Quran and ahadith of the Prophet Muhammad (pbuh) at the recent Women’s Edition Seminar for female journalists, held at Jakarta. Islam, and other religions for that matter, are not against contraception in totality. If the Quranic injunction on breastfeeding the child for two years is adhered to, it would automatically result in “lactational amenorrhea” which would result in spacing between children. A major body of Islamic scholars, globally, agrees that in Islam, temporary and reversible methods of contraception are allowed. But contraception practiced with an aim to have a permanently childless marriage would not be permissible. Abortion is not permissible, and especially after a 120 days period has lapsed in the pregnancy, it is categorically forbidden because life is sacred. Temporary contraceptive methods that do not harm the health of the mother, and natural methods like Coitus Interruptus (withdrawal) and the Rhythm method that relies on knowledge of a woman’s ovulation cycle in order to avoid pregnancy, are preferred and allowed. Relaying public health messages across to the population of Pakistan would become easier if they came through Imams of local mosques. But the religious leadership, human rights’ activists and health experts should work unanimously towards this goal. This requires dialogue and an understanding of each other’s view points. Posted in Faith, Human Rights, In The Loop and tagged BkkbN, Family Planning, Family Planning and Islam, Family Planning in Pakistan, Indonesia, Islam and contraception, World Population Day, Zofeen Ebrahim. Bookmark the permalink.